Two Aprils ago, our friends Deborah and Paul attended the Burke Museum‘s annual fundraising dinner/auction with us and we jointly purchased a one-day owl viewing trip with Rob, the Burke’s ornithology collection manager. Deborah is a fanatical owl lover. She couldn’t bear to miss out on the opportunity. We were happy to go along. A couple of months ago, we chose a date at last for this long-deferred trip. Yesterday. Three days ago, Rob suggested a 5:30 am start. He was tracking the latest news on owl sightings and had come up with an itinerary, one that would begin within Seattle at some of the more heavily wooded parks, followed by a drive 60 miles north to the Skagit River delta wetlands, a rich bird habitat. That 5:30 start was a bit of a shock. Heck, the sun wouldn’t even rise until 7:00. Some parks don’t open until then, or at dawn. After a few more email exchanges, we agreed to meet up at our house at 6:00 am, work out a plan for the day, then head out. By 6:00, everyone was here. Rob spread out maps, bird books, and explained the possibilities. The most disappointing news was that a great-horned owl had been living right next door to us, in the Arboretum, but it had just been hit by a car last Wednesday, its body brought to the Burke later in the day for preservation. For all I know, the owl had regularly passed over our backyard. No longer. At 6:45, we left for Lincoln Park in West Seattle. This would be the first of many stops that made me wonder what we’ve been doing with our time all these decades. We used to drive by Lincoln Park on the way to the Vashon Island ferry, when Gail’s brother Gary lived there 25 years ago. But we never stopped to go in. Rob led us about 200 yards west from the parking lot on the park’s eastern edge. It would have been around 7:15 at this point, a few minutes past sunrise. In the heavy woods, with clouds above, there was modest lighting. Suddenly, Rob halted us. He walked under a tree just a few feet off the walking path, looked up, studied the branches with his binoculars then came back to the path and looked up at an adjacent tree right on the path. There it was, about 40 feet up. A barred owl. Or so Rob said. He told us where to look and one by one we identified a blob on a branch. With binoculars, we could see the feather pattern and recognize that indeed the blob was an owl. Rob returned to the van, brought back a small telescope on a tripod, and with its aid the owl came completely into focus. What a marvel! Just sitting there, over the path that leads directly from the parking lot to a bluff over Puget Sound, one of the park’s main walking axes. After we had studied the owl enough, we continued west to that bluff, where between the trees, thanks to a break in the clouds and the illumination from the sun in the east, a section of the Olympic Mountains over Puget Sound to the west was glowing. It was a spectacular view. For me, the day was a success already. We walked around the park some more, with Rob pointing out a box built high up on a tree for nesting owls. Then we returned to the van and stopped at a nearby Starbucks, where Rob had offered coffee for the day. From there, we headed north to another of Seattle’s wooded parks over the Sound, Discovery Park. Here our goal was to look for saw-whet and long-eared owls. We stopped at the visitor’s center, got oriented, headed to one of the parking lots, and carried food from the van to a picnic table for our 9:00 breakfast. It was cold out there, with a breeze chilling us while we stood over the table and ate. But we were happy. Once the food was stowed, we headed up a hill in search of owls. Rob had some owl calls recorded on an iPod, with a speaker attached to amplify the sound. Every so often he would stop to play the calls. We worked our way up past the old Army housing of Fort Lawton, then over and down, returning to the open field where we had breakfasted and to our van. No luck. Then we covered much the same ground in the van, Rob stopping from time to time to scan the trees, but again no luck. Rob had warned us during our early morning planning session that, like fishing, looking for owls is about the process as much as the result. The process was enjoyable. We were content. Time to drive north. Through the city to I-5, north, out of Seattle, out of King County, into Snohomish County, through Lynnwood and Everett and Marysville, past the Tulalip casino, over the Stillaguamish River, into Skagit County, through the county seat of Mt. Vernon, over the I-5 Skagit River bridge, past the Burlington mall, off at State Route 20, which leads eastwards over the Cascades or westward through the delta to Fidalgo Island and Anacortes. 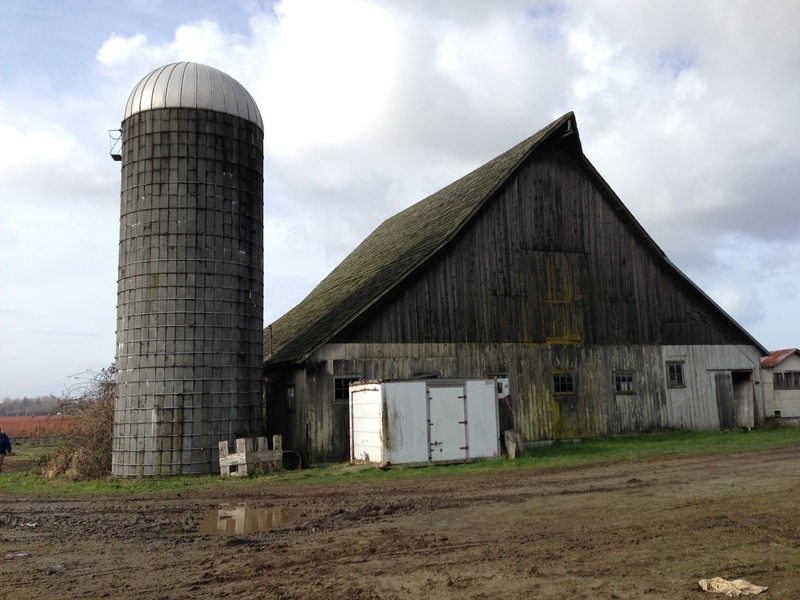 We went west for a few miles, then north, then turned west at a road leading to a farm, parking and heading across some muddy turf to the dairy barn pictured above. What’s a barn without a pair of barn owls? Or so we learned. As Rob would later explain, when he first conceived of these trips, he scouted barns, asking permission to enter, then asking permission to return with groups. Some said yes, some said no way. One fellow, for example, pointed out that he hadn’t had any mice in the barn for fifteen years, and he wasn’t about to let people come in and change that. It was a pretty good bet that the barns we saw were occupied, as this one was. Rob brought us in, then had us wait while he scouted. One owl flew out of sight, but he located the other, sitting high up where the main ceiling beam meets the wall. The view was blocked by a ceiling above us, except where there were gaps. Rob had us stand in one corner and look up to the opposite end, telling us how to find the owl. The women found him first. I saw a couple of blobs that might be what everyone was excited about, but I wasn’t sure. Then Rob found a new vantage, almost directly below, where we had to look through gaps in the ceiling, and this time I was pretty sure I saw the right blob. But we were looking from behind, so the blob had little detail. Then, heading a few feet over and finding another ceiling gap, we got to see the owl from the front. He was looking right down on us. Once Rob got the telescope, we could see his face in fuller detail, eyes wide open, directly above. That was great. If you’re wondering about the owl’s location in the photo above, he’s sitting just below the peak at the far end of the roof’s ridge line. Once outside, Rob had us examine one of the many owl pellets that he had pointed out inside. He explained that owls swallow their prey whole, then regurgitate all the indigestible material. By going through the regurgitated pellets, one can learn what the owl has been eating. For instance, well, I’ll skip the details, but Rob did break up and show us the contents of the pellet he had carried out, identifying some hard rodent body parts for us. Next up, the start of our search for snowy owls. As birds of the tundra, they are accustomed to hanging out in open fields. When they make their way down this way, they don’t suddenly take up residence in trees or barns. They continue to hang out in fields. We were instructed to be on the lookout for white objects standing two feet tall. But not the white milk jugs the farmers put out to help line up irrigation systems. And not signs. And certainly not the swans that also stood in the fields, or the smaller snow geese. We worked our way west and north and west and north, through the farmlands and wetlands of what I later learned is the Padilla Bay estuary. Along the way, we stopped momentarily at a small parking lot beyond which lay some wetlands of the Skagit Wildlife Area. 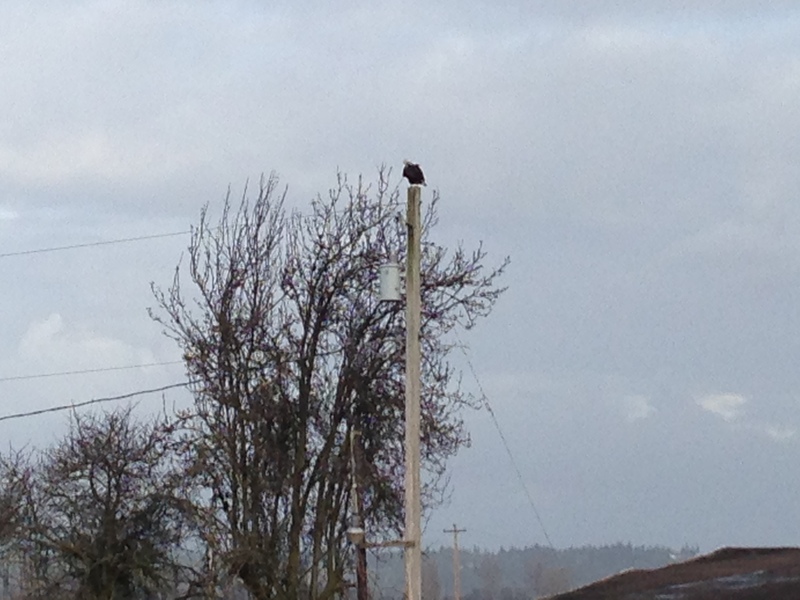 On leaving, heading north, we spotted two juvenile eagles standing on telephone poles and turned in for a closer look. Then, at the northernmost point of our drive, we rose above the tidal flats to the wooded elevation of Samish Island, which is not an island but rather a peninsula reaching out toward the San Juan Islands. After looping around Samish Island, we headed south to the Breazeale visitor center of the Padilla Bay National Estuarine Research Reserve. I picked up a pamphlet there about Edna Breazeale, a remarkable woman. She grew up nearby, came down to Seattle to attend the University of Washington, went on to teach English for 43 years, including 33 at nearby Roosevelt High School. Around 1960, she returned to the family farm in Bay View and turned into a community activist, leading a fight against development plans for the bay. Two decades later, over 11,000 acres were declared the eighth national estuarine research reserve. Brava Edna! It was lunchtime. A late lunch, around 2:00 PM, and therefore one eagerly eaten. Rob had shopped for a medley of options, all of which we were thrilled to eat. By 2:45, we were ready to head back south. We crossed over Route 20 into the famous Skagit tulip fields, continued south to Stanwood, then still farther south, where our snowy owl search got serious, for this was where two snowys were sighted on Thursday. It’s also the delta and tidal flats of the Stillaguamish, which flows into Port Susan Bay, with Camano Island to the west and Puget Sound beyond Camano. If you look at the photo and map in the preserve’s brochure (available as a pdf file), you can see where we were, just north of the point where the river flows into the bay. No owls, but there was a pair of eagles, one of whom you can see below. It was 4:30 now, the perfect time to retrace our steps and get back to the Skagit Wildlife Area, just north of the Padilla Bay visitor center. We arrived 5:30, with sunset and dusk approaching, a good time to see short-eared owls. As we walked south from the parking lot, we found that we had to cross a muddy stretch with water above our ankles. Gail and I weren’t brave. Having made it across, we decided to stay put. Rob set up the telescope and somehow found, far in the distance, a short-eared owl sitting on a post. We were happy. He went farther south with Deborah and Paul while we worked our way back toward the lot. A fellow bird enthusiast, camera and gigantic zoom lens in hand, asked what we had seen. We tried to point to the location of the owl. He was at the end of day three of a four-day organized trip, accompanied by some scientists. He’s from Olympia, he explained, and last week had seen eight snowy owls on another outing down that way. After we got back to the parking lot, another owl swooped by, pointed out to Gail by a woman sitting in a car in the lot. Having seen many harriers throughout the area, we assumed the other birds we saw near the lot were harriers. Or maybe it was just one, coming in from different directions. When two women reached the lot from the wetlands and asked if we knew anything about birds, I told them that we had an expert along who would be back soon. They said, well, they just wanted to know what that bird was. A harrier, we announced. That was sufficient expertise for them. Once our companions returned, Rob filled Gail and me in on the plan. It was getting dark now. We would drive back to Edna’s visiting center at the Padilla Bay reserve with the hope of spotting the great horned owl Rob had previously seen hanging out right there in the visitor center lot. And that’s what we did. No great horned owl though. Rob called for it with his recorded tracks. That didn’t do the trick. Some drinks and mixed nuts later, we climbed back in the van and headed home. By the time we arrived, unloaded our belongings, and said our goodbyes, it was 8:00 PM. A long day. But a very special one. Three owls seen, many more imagined, other birds galore, an overview of the wonders of Western Washington, good food, great company. And just maybe we learned enough so that we can head out on our own soon.